There is confusion over the late call-up handed to Akwa United defender Ndifreke Effiong by the Nigeria Football Federation on Sunday, as replacement for the injured Ola Aina. 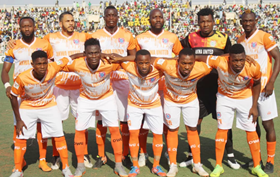 Akwa United confirmed on Sunday that Effiong suffered an injury in their Nigeria Professional Football League clash at Heartland, an injury which led to his substitution in the early stages of the second half. The 20-year-old had to be attended to by medics after he got injured as he attempted to make contact with a cross delivered into the vital area by Brazilian midfielder Alberico Da Silva. Effiong was having a good game prior to his injury-enforced substitution, scoring the opener as early as the third minute after he was set up by Mfon Udoh. The in-form fullback merited a call-up to the Super Eagles as that goal was his fifth of the season but has to undergo tests to determine the extent of the injury and his availability to the national team. The 23 players called up for the two games against Seychelles and Egypt are expected to start reporting for international duty on Monday, March 18.